Limerick housewife Dolores McNamara, who became one of Ireland’s richest people when she scooped €115m in the biggest lotto jackpot in European history, is involved in a bidding competition with Irish Life over future ownership of Limerick’s top-performing retail park, Childers Road Retail Park. Both Mrs McNamara and Irish Life have bid more than the €44m guide price for the park along with a UK fund, Savills Investment Managers. A third British fund Marathon apparently did not make the cut. The first three have qualified for a second and final round of bidding which is expected to take place in the coming days. Mrs McNamara, who is not known to have acquired commercial property investments in the past through her company Blue Haven, is being advised by Eddie Hobbs, the media personality and financial adviser. Irish Life has by far the largest commercial property portfolio in Ireland with investments valued at more than €2.5bn. The fund spent more than €700m in the last two years alone buying top of the range retail and office investments mainly in Dublin. Joint agents HWBC and DTZ Sherry FitzGerald are handling the sale of the Limerick Park for Harcourt Life, which acquired the entire share capital of IBRC Assurance Company. The park was developed more than 10 years ago by Alan and Brian McCormack of Alanis Capital with funding from Anglo Irish Bank. 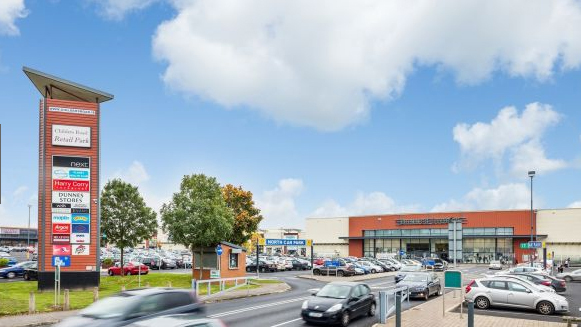 Childers Road is by far the most successful retail park in Limerick, producing a rent roll of €3.22m from 14 traders including Dunnes Stores which holds its extensive premises on a long-term leasehold. The high level of interest in the park by investment funds is largely due to its open use zoning which allows nine of the 14 outlets to trade as they wish. That freedom has opened the way for the promoters to attract some of the best known traders including Boots; Arcadia’s Burton,Wallis, Evans and Dorothy Perkins; Next, Lifestyle, Argos, Heatons, Harry Corry, Smyths Toys and smaller traders such as Costa Coffee, KFC and Pizza Hut. The UK fashion chain with four shops pays the top rent of €400,00 per annum followed by Next at €300,000 and Boots at €200,000. Childers Road has an overall floor area of 23,900 sq.m (257,000 sq.ft) and recently let 4,877 sq.m (52,500 sq.ft) to UK home, garden and leisure retail chain The Range which is to go into competition with Woodies at a number of key locations. The joint selling agents have been marketing the park on the basis of its freedom to accommodate a diverse mix of traders as well as the more traditional retail park names. The sale of Childers Road has coincided with a marketing campaign to find a buyer for a smaller Ennis Road Retail seeking €15m for the park which is producing a rental income of €1,476,000 per annum.